Every year CSAE salutes members who have distinguished themselves through sustained service to our profession. At the CSAE National Conference in Ottawa during the month of November, Trillium Chapter members won several of those awards. As a Chapter, we are proud to have such exemplary members amongst our ranks and we would like to share with the entire CSAE Trillium Chapter community the accomplishments of these award winners. Robert Thompson, Senior Vice President, Publisher and Co-Owner, MediaEdge Publishing Inc. 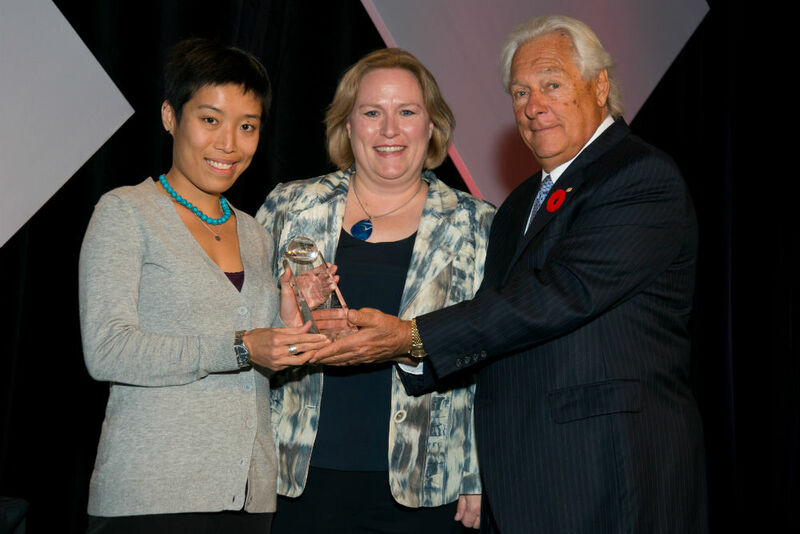 The Griner Award recognizes a Business Member who makes a significant contribution to CSAE and Association management. Recipients may be an individual and/or their organization who have contributed in a manner beyond the expectation of daily business over an extended period of time. Robert Thompson has devoted his entire career to serving the association community. He willingly shares his knowledge and expertise with association executives at both the national and local levels, has been a mentor to others, and is a well-liked and respected “ambassador” who tirelessly promotes CSAE to new and prospective members alike. Since becoming a CSAE member in 1982, he has consistently increased market share for publications and grown advertising revenues for a diverse range of associations. MediaEdge Publishing is in fact the publisher for the CSAE Trillium Chapter e-newsmagazine, FORUM, as well as CSAE’s Association magazine. Despite the time pressures involved in managing a successful business, this former professional football player serves on the Board of Directors for both the Toronto Argonaut and Canadian Football League Alumni Associations, volunteers for the hearing impaired at the Rumball Centre, and participates in the Princess Margaret Hospital’s ‘Road Hockey to Cure Cancer’ program. Congratulations, Robert. It is a pleasure working with you. The Best Website Award goes to an organization whose website serves as a hub for Ontario’s health care consumers and provides a platform for supporters to join the association’s campaigns. Weekday traffic averages 500 visitors daily, and almost 70 per cent of those visitors have not previously visited. During a recent campaign partially run from this website, more than 9,000 Ontarians sent “e-postcards” to MPPs, which ultimately helped secure funding for a pilot project of birth centres in the province. Clearly, this website is having an impact. Congratulations, Association of Ontario Midwives. This publication is a source of pride among members. Written largely by members for members, Consult Magazine keeps management and consultant professionals and potential clients abreast of issues, trends and ideas. It strongly promotes certification, and is distributed to governments, the media, and Chambers of Commerce to raise awareness of the professionalism of those holding the CMC designation. Congratulations, Canadian Association of Management Consultants. Each year CSAE recognizes the Chapter that has demonstrated effective practices in keeping with CSAE’s Chapter Operational Standards, including operations, leadership, financial and legal management, communications and promotional activities, membership retention, website content, volunteer development, professional development for members/networking, awards promotion, business continuity, risk management, and provincial/municipal government affairs. Ongoing refinements to existing programs, combined with the introduction of new member-focused initiatives, enabled the Trillium Chapter to exceed its budgeted surplus while at the same time significantly enhancing member participation and satisfaction. One initiative of their new program is to recognize and support the efforts of members through scholarships to attend CSAE national and local education events. This year, seven scholarships, each valued at $500, were awarded to members. The CSAE Trillium Chapter is proud to have won this award. Member engagement has never been higher and we look forward to another very positive year ahead. The Associations Make a Better Canada Awards recognize CSAE member organizations that initiated innovative projects within the past year, resulting in positive outcomes. Trillium chapter members received awards in the public affairs/government relations category as well as the ethical, technical or professional standards category. This in-house campaign, designed to secure funding for birth centres in Ontario, began at Queen’s park with presentations to over 60 MPPs. A social media campaign was launched to have birth centre funding included in the budget, and a Social Media Day resulted in the highest-ever day of website traffic and national media coverage. The Premier of Ontario publicly praised the “Ontario Needs Birth Centres” campaign and, in less than a year, funding was secured for two centres: a health care innovation that will benefit Ontario women and families by delivering excellent professional care. Congratulations, Ontario Association of Midwives. Building Owners and Managers Association of the Greater Toronto Area developed and managed its own energy conservation and demand management program, which targeted the Greater Toronto Area’s commercial real estate market. The program—one of only four sanctioned by Ontario’s Power Authority to help meet provincial energy demand reduction targets—sustained an average annual growth of 100 per cent in savings over four years, making it one of the best performing programs of its kind ever delivered in Ontario. Today’s winner is Ontario’s first and only non-utility to ever deliver such a program directly to end-users. Their model is simple and effective; it achieved substantial electricity conservation, and could be easily replicated in other Canadian jurisdictions. Congratulations, Building Owners and Managers Association of the Greater Toronto Area. One member of the 2012 CAE graduating class was selected to deliver the valedictorian address. Cheryl delivered an engaging speech on behalf of the 2012 CAE class. Her address is located on the “Congratulations, New CAEs” page in this issue of FORUM. The following members received Long-Time Service Awards this year. The Long-Time Service Award recognizes those individuals who have been CSAE members for twenty years. As well, special congratulations to Dennis Souder, CAE, a Trillium Chapter member who has been a member of CSAE for 40 years.